The Grohtherm 2000 Thermostatic Shower Mixer is perfect for the family bathroom and boasts many safety features. The GROHE CoolTouch® technology prevents the tap body from heating up to protect children from scalding on hot tap surfaces whilst the SafeStop button prevents the temperature from being turned up too high and can be easily adjusted for personal preferences. The StarLight® chrome finish makes it easy to clean and is scratch resistant. To reduce water consumption the mixer is fitted with an EcoButton that reduces consumption by up to 50% without compromising on your comfort. 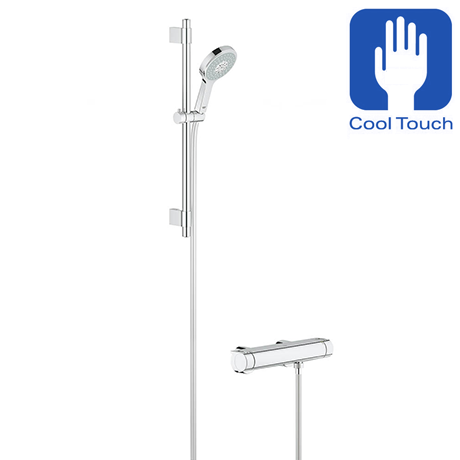 Includes Power&Soul shower kit consisting of a 600mm shower rail, 1750mm Silverflex shower hose and a Power&Soul® Cosmopolitan 4 Spray Handset.